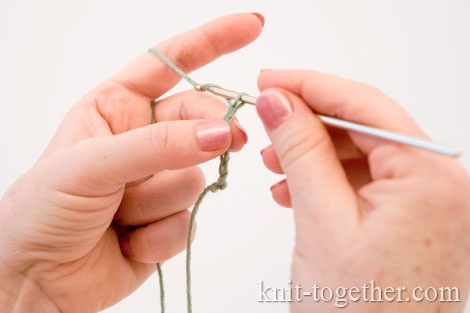 Knit Together | The Chain Stitch and the Turning Chain. Crochet Lessons for beginners. 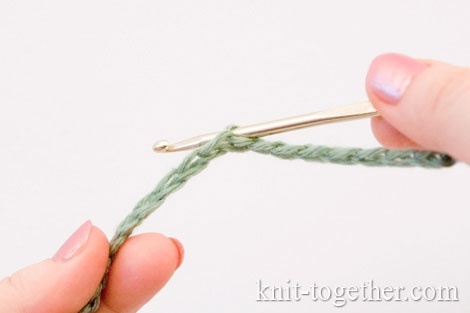 How to crochet the Chain Stitches. 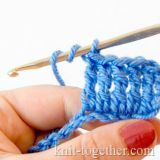 There are several basic stitches which a beginner crocheter must know. The chain stitch is the most basic of these. Group of chain stitches form a chain, which serves as the initial row. The chain stitches are also part of many patterns. 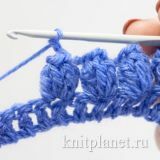 How to crochet the chain stitches shown in pictures. First you must make a slip knot. Thumb and middle finger of left hand you hold the slip knot. 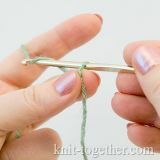 Index finger holds and directs the working yarn. 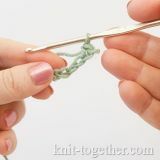 Grab yarn with the crochet hook (hook is under yarn) and pull it through the slip knot, and so, you made a chain stitch. 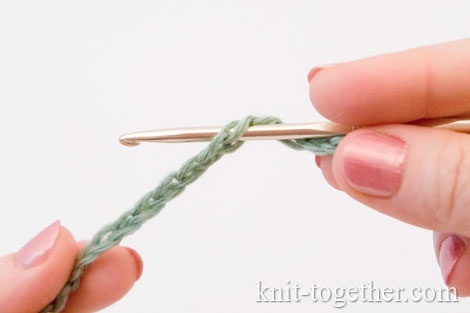 To make next chain stitch you must again grab yarn with the hook and pull it through the new loop. So, consistently having made some number of loops, you get a chain. 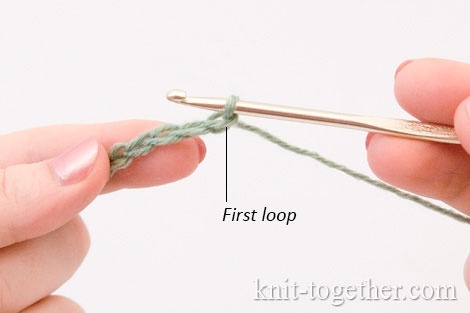 Important information: when counting chain stitches, the loop on the hook not considered. The first stitch in the next row will be the one that is before the loop on the hook. If you are beginner then try to make the chain until it will be look smoothly and enough loosely. The chain don't must be too tight otherwise you can't insert hook into it. If the chain is too loose then it looks casually. There are two chains in the picture above. The upper chain tightened good, and the lower one is too tight. As already mentioned, the chain serves as the initial row of crocheting. The side of chain which facing you reminiscent a pigtail. When you crochet there are three ways to insert a hook in the chain stitch: under front loop, under back loop, under front and back loops. Next row easier to crochet into the front loop, but the first stitch always crochet into both loops (into the front and back loops), in this case, the edge will be smooth and dense enough. In order to crochet a beautiful lateral edge used a turning chains. 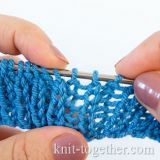 The turning chains are chain stitches at beginning of the new row, which allow to rise to the height required to crochet the next row. At the start of the work you make the required number of chains and then add the required number of chains for the turning chain. The number of chains for the turning chain varies for different stitches as the height of stitches is different. 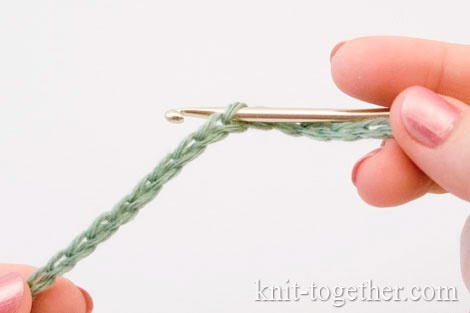 The slip stitch is the shortest of all crochet stitches, but the double crochet stitch is much higher. The higher a stitch the more the number of chains need for the turning chain. If the turning chain will not be enough, side edge of your work will be too tightened; excess chains in the turning chain will form not smooth edge. 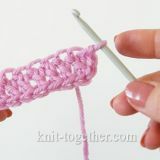 double crochet stitch - two chains for the turning chain. When counting of chains in the turning chain, the loop on the hook does not count, and the chain immediately below the hook is called the first chain.